When you sign up for web hosting your account will include access to a control panel. In this article, you’ll learn what control panels are used for, what types of options you have, and how to choose one. For developers, we also address advanced issues like multi-server management and scalable clustering. Let’s dive in so you can get your questions answered. 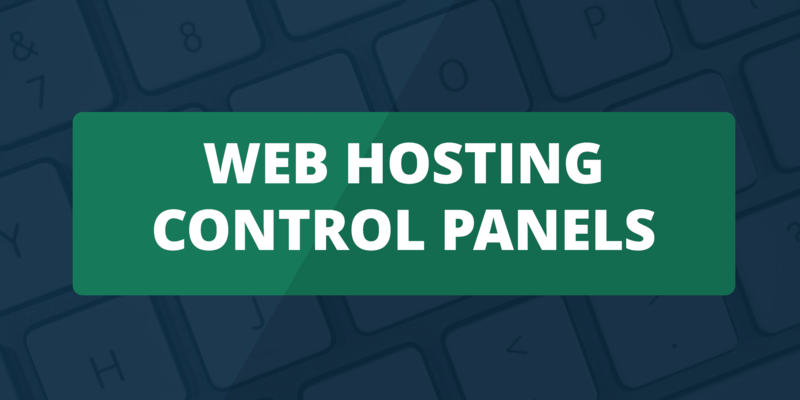 A web hosting control panel is a graphical user interface (or, in some cases, a web-based interface), that is accessible online and provides tools for managing a website, the web hosting account, and sometimes the server. In most cases, you will access your control panel via a web browser, though this may vary on occasion. Almost every hosting company has a control panel, and some offer you a choice of control panels. It’s the most visible part of a web hosting plan, and its features and functionality will largely determine the quality of your experience as a web hosting customer. Why Use Graphical User Interfaces for Control Panels? Think about what you expect to see when you turn on your computer. Do you want to type long commands into a black terminal screen with monochrome lettering? Or would you rather use your mouse to navigate around a graphical interface, clicking on icons and moving windows around? Most people would prefer visual. Its the same way with web hosting and server management. You can, in theory, access your web hosting account and server without a dedicated interface using primarily with tools like SSH (secure shell — direct command line access) or FTP (File Transfer Protocol). In fact, it’s definitely a good thing to have one (or even both) available options, and you might want to learn the ins and outs of that way of doing things. But most of the time, your life is going to be easier — and your work is going to get done faster — if you use a control panel. Some of these tasks might be one-time events like setting up your website and transferring all of your content files. Some will be regular occurrences like updating existing files or looking at your website’s analytics. Knowing what you’ll be using the Control Panel for will help you decide which one is right for you. You will be able to narrow down your options based on the features available. Typical account management tasks that will be handled within your control panel include altering your billing profile, plan renewal, updating of your password, and similar items. The software running the control panel will be handling your credit card information. If that software is not secure and up to date, it could be a problem. You do not want to be on the hook for things that you did not purchase! Generally speaking, domain management, though infrequently done, might be one of the more complex (yet important) things you do. This is one area where you really want to make sure you understand how your control panel has things set up. If you plan to use a popular web application or content management system (CMS) like WordPress, Joomla, Drupal, or ZenCart, the quickest and easiest way to get these loaded onto your hosting server is to use a one-click installer” like SimpleScripts or Fantastico. One-Click Installers are exactly what they sound like: you look up the product you want and click “install.” The installer will take care of the rest. For example, if you are a WordPress user, you will not have to manually download a copy of the WordPress core, only to then upload it via FTP to your website’s server. If your hosting company provides these services, they will be available from the control panel. Set up email spam filters. While this may sound minor, it eliminates hefty administrative tasks in the long run. File Transfer Protocol (FTP) is a process to access files and folders on the server. It is also how you move files around. Did you create an HTML file for your website on your personal computer? Well, to get that file onto your server and online, you will need to use FTP to transfer the file to your web hosting provider. Setting up FTP accounts and access generally requires access to a control panel. You will need a database to manage your data and to manage your database, you will need a control panel. For most people, the MySQL databases that come standard with web hosting packages are sufficient. As such, many control panels play nice with MySQL. Are there any issues with my data, database, or database server that I need to know about? If you are (or want to) use a different type of database, whether it is a SQL or NoSQL database, you will want to make sure that the control panel supports such integrations. For example, some hosts will, by default, support PostgreSQL, but if you need to use Microsoft’s SQL Server, your choices will be more limited (and, in most cases, more expensive). You may want to use FTP instead of a browser-based file manager to manage the files on your server. However, if FTP is not for you, most control panels provide some type of browser-based file manager — through their ease of use varies tremendously from system to system. Some web hosts provide an easy-to-use drag-and-drop system, while others seem to have options that have not been updated since the early 1990s. Furthermore, using FTP does not mean you can eschew the control panel completely. You will still need the control panel to set up your FTP users. You will need to create the users and grant them with the appropriate levels of permissions needed to complete their tasks. Most control panels include some kind of built-in file backup utility that runs regularly. If this is not the case, you will have access to a third party backup system. Regardless, your control panel is where you would go to create backups, as well as access any of the backups that have been created. Sometimes, you may also use it to restore a backup. Live chat support and other on-demand support features are almost always administered through the control panel. Sometimes, you will also find knowledgebase documentation and FAQs on pages located in the control panel. However, some hosts might have these files hosted elsewhere. If this is the case, you will find links to the documents on the control panel itself. You are going to get very familiar with your web hosting company’s control panel. When you first purchase a new hosting plan, you will see the control panel more often than your new website. You will have to come back to it on a regular basis — daily, if you’re diligent — to check basic stats and server usage and make sure everything is running smoothly. Since you’ll be using it frequently, it’s important to find an option that you enjoy using in addition to offering the features and functionality you need to do your work. The control panel will be your primary experience of your web hosting account. You can’t see speed and performance for your website and server, but you can see the control panel. How easy or hard it is to use will be a major determining factor in your overall satisfaction with your web hosting plan. There are some advanced users out there who want a particular tool and can only get it from a particular control panel. But for most of us, any one of them will get the job done — most control panels do about the same thing. This is a good thing, especially for those with shared hosting plans who do not have many options available. Regardless of what your host offers, you are likely to get a good option that will meet your needs and do what you need it to do. With that said, not every one of them will make sense to you. A different way of dealing with tasks. If you have a control panel that does everything you need but does not fit your user habits quite right, you won’t enjoy using it. Most web hosting companies only offer one control panel. Some offer two or three to choose from. Typically, Linux-based plans come with a cPanel/WHM, while Windows hosting plans come with Plesk. Honestly, your choice of control panel might very well come down to the operating system your web server is using. If you opt for VPS or dedicated hosting, you will have even more options. You can install pretty much any option you would like (within reason, of course). Once you’ve narrowed down your hosting choices to just a few based on other factors, you should see if they have different control panels. If your hosts do offer a variety of options, see if you can get a demo. Many web hosting companies have a “sandbox control panel” that you can try out. cPanel is the most widely used of the web hosting control panels available, with Plesk coming in second. Much like some people swear by their iPhones, while others will only use phones running the Android operating system, both cPanel and Plesk users will argue their system is easier and better, and both are right. cPanel is a web-based, Linux control panel. As we said above, cPanel is web-based so that you will be interacting with the product through your web browser. Icons in each group can be moved around your interface in a drag and drop fashion. This is similar to moving folders on your desktop, and it allows users to simplify their experience by front-loading the tools they use most. There are some limitations, such as not being allowed to move icons from one group to another. Furthermore, if you are installing cPanel on a VPS or dedicated server, note that it can be very difficult to uninstall cPanel without completely reformatting your disk drives. Given such complexity, we will say that once you have chosen cPanel, it can be very difficult for you to move to another option. Essentially, uninstalling cPanel is possible, but it is not probable that you will do so. Plesk, on the other hand, has an interface heavily influenced by Windows (it also happens to run on Windows servers, which cPanel does not). It combines the icon-based display with more text-based windows, which resemble the Windows Control Panel. Things like system and domain information, statistic resources, email management tools, and applications are presented in two columns, window-style on the main screen. This makes it easy to find anything you need without any scrolling. While cPanel splits its product up based on the personnel it expects to use certain features, Plesk does not make such defined distinctions. This is especially between client-side/end-user and server-side/administrative features. Plesk Extensions allow you to easily add features and functionality to the default installation, as well as integrate with third-party tools. You do not have to use Plesk or cPanel if you do not want to — there are many other control panel options available. All of them organize tools in their own unique way and offer slightly different approaches to accomplishing the same tasks. Some hosts use their own custom control panels, or customized versions of cPanel, Plesk, and so on! For example, InterWorx provides a tabbed environment, limiting the content on each screen. vDeck sports a very similar look and feel as cPanel, but categorizes items by purpose rather than type, so your database, file manager, and website creator are all lumped under the ‘website’ category. Some users find vDeck’s approach convenient, while others find it less intuitive than cPanel’s organization. Both InterWorx and vDeck auto-create a common items category, where your most commonly used applications and tools are stored. Ultimately, regardless of the control panel your host offers, you will still be able to accomplish all the same tasks. However, you may find it easier to navigate one over the other. DirectAdmin is an easy-to-use, performant, and highly stable control panel option for Linux users. In addition to backing its product with top-notch support, DirectAdmin offers a wide variety of licensing options to fit the needs of websites both small and large. DirectAdmin was first released in 2003, and the product has been continuously updated since then. The company prides itself on keeping up with current technologies, and if you need a control panel with a multilingual interface, be sure to check out DirectAdmin. You will find that DirectAdmin supports most of the popular website-related tools, including MySQL/MariaDB, Apache, NGINX, Litespeed, PHP, and more. H-Sphere is a cross-platform control panel written in Java that works with any SQL-type server/database. Note: It is certainly not the easiest-to-use option. With great power comes a steep learning curve and a user interface that is not a candidate for best on the web. H-Sphere comes with solid documentation and has a robust community. Though the product itself may be tricky, you will find it easy to get help should you need it. Obviously, if you are looking for a control panel, you will be interested in SiteWorx. SiteWorx comes with all of the functionality you expect from a control panel, but its control panel does feature extra focusing on server cluster management and load balancing. InterWorx offers the web-based, graphical user interface you expect, but do note that all functions can be done via command line or API as well. If you need a control panel option that is as lightweight as possible, InterWorx is definitely an option you should consider. The system requirements are minimal, and some have used it to run server clusters on Raspberry Pi devices. ISPConfig is an open source control panel that runs only on Linux machines. It was first launched in 2005 and is still actively developed. ISPConfig is a stable, secure, and performant option that comes with lots of documentation and a large community that is able and willing to help. If you need enterprise-level functionality, ISPConfig ships with some. ISPmanager is a Linux-based option aimed at users with virtual private server (VPS) hosting or dedicated servers (though it can certainly be used to provide shared or reseller plans). There are two versions of ISPmanager: Lite (which is for personal use) and Business (which is for those providing shared hosting services). The full ISPmanager option might be a bit too much in terms of features for the everyday user, and if this is you, consider the ISPmanager Lite. It is a simpler option that allows you to manage your personal server and websites. If you need to add to the functionality that ships with ISPmanager, you can do so by installing extensions. ISPmanager’s support for third-party software is wide-ranging and includes things like Apache, NGINX, MySQL, PostgreSQL, Sendmail, Exim, and Postfix. You can use the open API to integrate and deploy changes to your web hosting. vDeck prides itself on its easy-to-use tools and easy-to-navigate interface. vDeck is very similar to Plesk and cPanel (including its looks and appearance), but it comes with more advanced tools and features built-in. More specifically, you will get the website, email, domain, and account management features you expect from a control panel, but you will also get e-commerce and marketing-related services. Virtualmin is an open source control panel designed for use on both physical servers and cloud servers running Linux or BSD. There are two versions of Virtualmin. First, there is an open source, a community-maintained version that can be used by anyone free of charge. However, there is also a premium version of Virtualmin that is more feature-filled than the open source version and comes with added support. The paid, premium version is great for those who need a more robust control panel for their website or web app. Virtualmin is built on top of (and still integrates well with) Webmin, which we discuss immediately below. Virtualmin differentiates itself from Webmin by branding itself as an option for serious system administrators who need lots of features for managing their infrastructure. Strictly speaking, Webmin is not like a control panel when it comes to the features offered — it is actually a server sys admin tool for managing servers. However, we thought it would be useful to mention Webmin, especially if you grow to the point where you are managing multiple servers for your website or web app. Though Webmin was once available only on *nix systems, it can now be installed on Windows servers as well. Though there is a single software developer who created and manages Webmin, Webmin is based on modules, which makes it easy to customize the product to suit your needs. Furthermore, anyone who wants to create a module can do so. WHM, like Webmin, is a multi-server management tool used by admins (and sometimes resellers) to manage hosting accounts on a web server. You should also know that WHM is a sister product to cPanel. While cPanel focuses on the client-side functionality (that is, those needed to manage the website), WHM focuses more on server-side features and functionality. If you use WHM, you will likely be using it in conjunction with cPanel. Regardless of whether you have opted for shared, reseller, VPS, or dedicated web hosting, control panels are a crucial part of your website management experience, so be sure to pick the option that best fits your needs, both in terms of features and preferences. Are different control panels available for different operating systems? Yes. The most popular control panel, cPanel, is only available on CentOS, RedHat and CloudLinux. Plesk, on the other hand, is available on Windows and many Linux installations. Most control panels will run on Linux, as most hosting plans are Linux-based. If you choose a Windows server, your options will be much more limited, but there are still quite a few options to choose from. If I stick with the same control panel, will I always have the same programs available for one-click installation? Not always. The one-click installer your host provides is not based on the control panel, though it may be limited by the control panel. The big three script libraries, Fantastico, Softaculous, and SimpleScripts, can be run on most popular control panels, so most hosting companies will use one of these. Fortunately, regardless of the script library your host offers, the most commonly installed applications will be available. However, if you have a preference, this may be one more thing to research when selecting your host. Can I change my control panel? That depends on the plan and your host. In most cases, shared hosting plans come with a single, preinstalled control plan. Some hosts offer different control panels with different plans or with different operating systems. With virtual private hosting (VPS), you may have more options available. In some cases, if your host provides root access, you will be able to install your own control panel, though this is not guaranteed. If you do wish to install your own, you should check with the host before committing. With a dedicated server, you should have root access, which means you can purchase and install any control panel you desire, provided it’s available for self-installation. Of course, if you prefer not to mess around with setting up or paying for your own control panel, you can just stick with the one your host provides. Is cPanel be the same from one host to another? In general, your cPanel experience should be the same regardless of the host. Your host has some control over the features that are included and may offer different services for installing web applications, but the organization and tools will be the same. The same goes for most other control panels, and for very good reason. Just as Microsoft doesn’t care if you’re using a Dell or HP, the team behind cPanel doesn’t care who your host is, so long as you keep picking hosts that use their control panel. Some hosts will customize their control panel, but this is typically done in much the same way Samsung and HTC offer a custom Android experience. While the look may be slightly different, the user experience will be nearly identical. As a host, what advantages are there to one control panel compared to another? While the difference for clients mostly comes down to cosmetics and organization, for the host, different control panels offer a variety of tools and features. cPanel offers the obvious benefit of being able to say you provide the most popular control panel. Nodeworx, the admin side of Interworx, offers advanced permissions management, tools for handling clustering, branding capabilities for resellers, and a number of other features to make a host’s life easier. Plesk gives more capabilities to clients, which can reduce the administrator’s workload. It also structures its databases around customers as opposed to domains, making it easier to set up reseller accounts. There is also the issue of cost, which will carry over to your hosting accounts. Some control panels, particularly open source or home-built solutions, can offer substantial savings, but you will need to weigh this against offering a control panel that clients are familiar and comfortable with.